New order arises when unrelated things in chaos or disorder interact with each other. Ueno Masaaki focuses on creating new order / new system in which unpredictability and indeterminacy coexist with regularity. His ideas come from interest in the state of the world, natural phenomenon and natural law―including weather, biological processes or physical processes. He incorporates these spontaneous phenomenon and processes into his work to recreate them as “Artificial natural phenomenon with new order.” Ueno Masaaki studied composition, piano and conducting at Toho gakuen school of music in Tokyo, where he completed the masters course. One of his chamber works was selected for the 76th music competition of japan awards. His winning music, “Resonance of zero degree” was broadcasted on NHK-Classics, and played on NHK-FM. While still a university student, he provided his musical works and selected background music for several fashion shows by Junko Koshino, and Goro Ito. In 2007, Ueno’s idea for making a concert were chosen by Suntory holding limited, and he succeeded in holding the p[l⇔r]ay for our world concert at Suntory-hall in Akasaka,Tokyo. 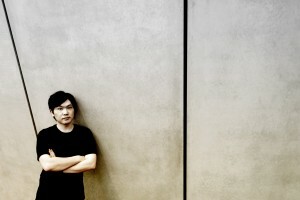 His other highly acclaimed accomplishments include conducting for the soundtrack of NHK’s TV drama, “Kou-myou ga tuji” and working as a sub-conductor for the musical “Take Flight” by Amon Miyamoto.In 2012, Masaaki started, P±H – a group of artists that create new sound installations, and starting from 2013, he composed and published electronic music works under the name of Ueno Masaaki / Ωprojekt. His first release on raster-noton will be his ep “vortices”, part seven of the unun-series and out on september 22, 2014. Copyright © 2019 UENO MASAAKI. All Rights Reserved.